While consumers are rapidly switching to LED lighting to reduce costs and save energy in their homes, LEDs are also replacing traditional lighting technology for commercial and public service users. Online sources such as LEDOutfitters.com deliver LED lighters and warning lights in a wide variety of configurations and prices. One example is a 60-watt combination flood and spotlight that the web store sells for $65. 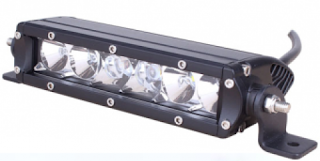 The bar is designed for work vehicles that need to illuminate an outdoor work site. LEDs have almost completely replaced incandescent lighting for police and safety vehicles. LEDs have proven to be lighter in weight, longer lasting and less expensive than the competition. In addition to its catalog of products, the LED Outfitters website also has videos of products in action and a page that features discount offers.